mission statement for Arts & Services for Disabled, Inc.
Love Before Learning. Learn for Life. 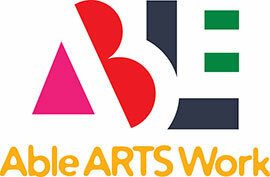 The primary vision of Able ARTS Work (formerly known as Arts & Services for Disabled, Inc.) is to provide lifelong learning, community service and vocational opportunities through the creative arts for people of all abilities and all ages in an environment of warmth, encouragement and inclusion. Able ARTS Work offers valid continuing education to further the education of board certified music therapists and other creative art therapists. …,regardless of functional capability, have a right and responsibility, to contribute to the well being of their community and have a vocation of their choosing. …should have access to an informed and supportive community, which must play a vital role in removing the barriers to full involvement and inclusion. …should have access to the expressive arts in vocation, education, leisure, health and wellness. …have the right to express and practice their cultural and artistic heritage. Able Arts Work supports a full creative life for all and upholds standards and practices that value the contributions of a diverse community.